The attention of the oil and gas industry will be focused on several meetings and conferences across the Middle East and North Africa, and any reactions to recent falls in oil prices. Corporate earnings season continues, providing insights into how well Big Oil has weathered several years of turbulence, with Italy's ENI reporting on Friday. Meanwhile, in the markets, further drops in oil prices are expected due to a sharp increase in US production forecasts and the recent correction in global stock markets. Elsewhere, physical coal traders will be watching closely macroeconomic factors that drove physically delivered markets down by $15 a metric ton over the last two weeks. Finally, in the chemical market, traders are facing a race against time if they want to export gasoline blending components toluene and mixed xylenes to the US. Our social media question for this week: Will oil prices keep sliding in the next few weeks Tweet us your thoughts with the hashtag #PlattsMM. 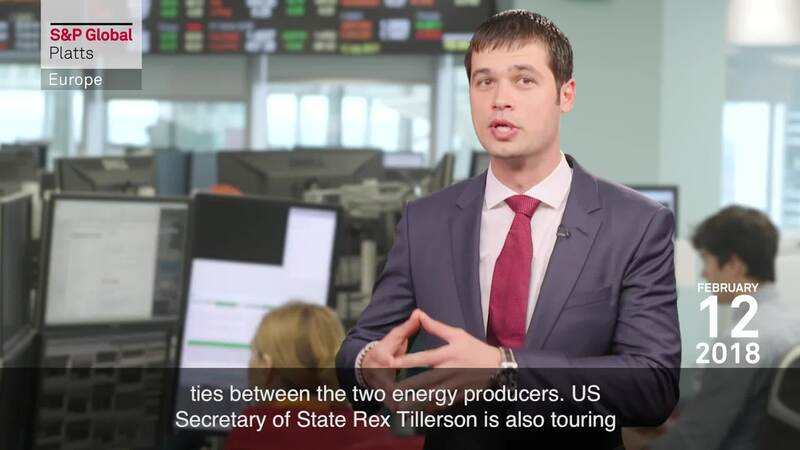 In this week’s highlights: Oil prices feel the pressure from higher US production forecasts; thermal coal prices are buffeted by macro-economic factors; and traders face a race against time to take advantage of an arbitrage opportunity in the chemicals market. But first: the attention of the oil and gas industry will be focused on several meetings and conferences across the Middle East and North Africa, and any reactions to recent falls in oil prices. Saudi Arabia hosts Russian energy minister Alexander Novak at a symposium in Riyadh on Wednesday, part of a trend of strengthening ties between the two energy producers. US Secretary of State Rex Tillerson is also touring the region, and attending an Iraqi reconstruction conference in Kuwait. The markets will be looking for any comments on oil-related sanctions against Venezuela or Iran. Also, key figures in the world of oil -- including BP CEO Bob Dudley, Eni CEO Paolo Descalzi, and OPEC Secretary General Mohammad Barkindo -- will be in Cairo for an energy conference this week. Also attending will be the head of Libya’s National Oil Corporation, Mustafa Sanallah, who will be promoting his country’s reconstruction. And the corporate earnings season continues, providing insights into how well Big Oil has weathered several years of turbulence, with Italy's Eni reporting on Friday. CEO Descalzi is likely to discuss hopes for building a gas export hub in the Mediterranean at the Cairo conference, after his company announced a sizeable gas discovery off Cyprus last week. In the markets, further drops in oil prices are expected due to a sharp increase in US production forecasts and the recent fall in global stock markets. According to the latest outlook from the Department of Energy, US production is expected to average 10.6 million barrels a day in 2018 and 11.2 million in 2019. Both estimates are more than 300,000 barrels a day higher than last month. To put those figures into perspective, OPEC kingpin Saudi Arabia has a production quota of just over 10 million barrels a day under the OPEC/non-OPEC output deal. The impact of the US numbers has been amplified by market turmoil as investors sell off speculative long positions. Our social media question for the week is: Will oil prices keep sliding in the next few weeks? Tweet us your thoughts with the hashtag #PlattsMM. And the oil market is not the only one grappling with a fall in prices. The price of physical thermal coal delivered to Europe has been driven down around 17% from $98 per metric ton at the start of the year, effectively closing the US to Europe arbitrage. A fall had been on the cards, but it has come harder and faster than many expected. Traders will be watching closely the factors behind the drop such as the fall in equities and the oil complex to gage future market direction. In the chemical market, traders are facing a race against time if they want to export gasoline blending components toluene and mixed xylenes to the US. To ensure a profitable sale, the products need to reach the US by the end of February. A voyage from Europe to the US could take longer than three weeks. Skepticism is growing whether there would be firm demand there in March. Potential US customers are also likely to seek a steep discount on European material to domestic product. And higher quality requirements in the US make the arbitrage more difficult to work for mixed xylenes.